Chocolate Banana Soft Serve with chopped almonds, cacao nibs and raspberries. OMG! This stuff is amazing and if you haven’t tried banana soft serve yet, let today be the day. I use to make it with a little yogurt added in but since I have given up dairy I have discovered it really doesn’t need it. First you have to freeze some ripe bananas so go check your fruit bowl and if you have ripe bananas in there peel them, slice them and toss them into a freezer bag. Freeze until firm – several hours. If you have a high powered blender it works well for this job. If not don’t despair, I have found my food processor does a decent job too but you might need to add a splash of almond milk to help it blend.We often times find ourselves at the end of the day 200-300 calories shy of our daily goal and if we aren’t too full from our dinner we might enjoy a dish of banana soft serve with a 1/4 ounce of chopped nuts, a teaspoon of cacao nibs and a few berries. 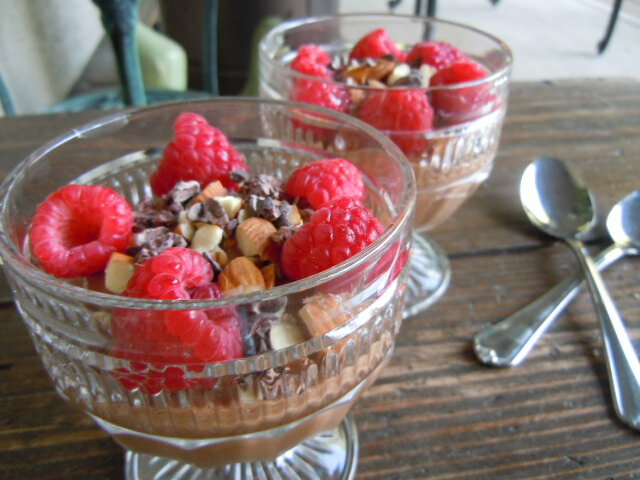 This is an amazing healthy dessert. 3 super ripe bananas that have been peeled, sliced and frozen. *If your bananas are super ripe you won’t need any sweetener – I like to let my bananas get overly ripe so they are super sweet and then freeze them. Toss everything into a high powered blender or the work bowl of a food processor – process until smooth and creamy. It will be like soft serve. Add a splash of almond milk if needed to make it blend easier and become creamy.